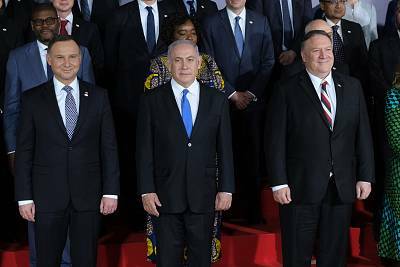 WASHINGTON — Israeli Prime Minister Benjamin Netanyahu startled Iranians and even the White House on Wednesday with a strident call for Israeli-Arab action against the government in Tehran that was translated by his office as urging "war with Iran. "Although Israeli officials tried to soften the reference by altering the English translation, the provocative comment was likely to further the perception that Israel, its Gulf Arab neighbors and the United States are interested in using military action to topple the government of Iran. It comes at a particularly delicate moment, as the Trump administration uses a U.S.-organized summit in Warsaw and this week's 40th anniversary of the Iranian Revolution to try to rally the world against the government in Tehran.Netanyahu, in a short video recorded on the sidelines of the summit, emphasized the significance of Israeli and Arab officials appearing in the same venue, noting that the summit was "not in secret, because there are many of those." 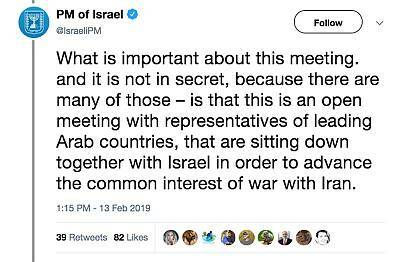 "This is an open meeting with representatives of leading Arab countries that are sitting down together with Israel in order to advance the common interest of war with Iran," Netanyahu said.The Israeli government posted the Hebrew-language video on Facebook and Twitter. In the video, Netanyahu uses the word "milchama," which is literally translated to "war" but can also be used figuratively to refer to "combat" or "battle. "Netanyahu's office also tweeted his statements on its English-language Twitter account, and used the word "war." 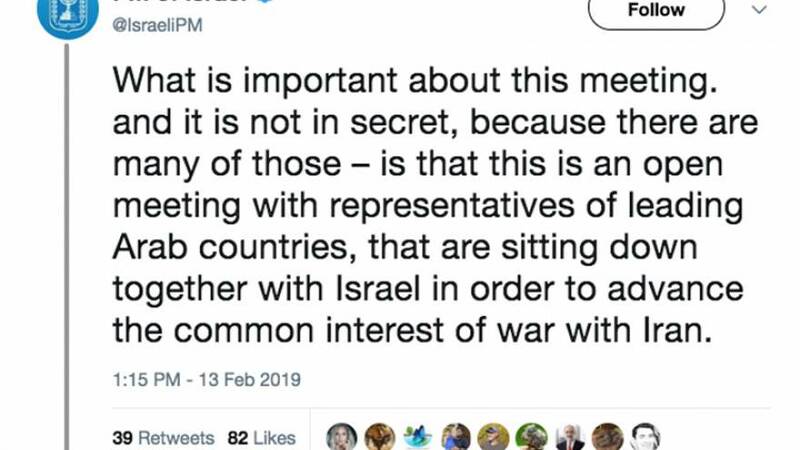 Shortly after, as Netanyahu's comments ricocheted around the world, the tweet was deleted and replaced with another one that changed it from "war with Iran" to "combating Iran." The original video of Netanyahu's remarks was not removed from his Hebrew-language Twitter account. "We've always known Netanyahu's illusions. Now, the world — and those attending #WarsawCircus — know," Iranian Foreign Minister Javad Zarif responded on Twitter.The U.S. government quickly reached out to Israeli officials to ask for an explanation. A senior U.S. official traveling with Vice President Mike Pence, who is attending the summit in Warsaw, said that senior Israeli officials told the U.S. that it was a matter of bad translation.But Sen. Angus King, I-Maine, a member of the Senate Intelligence Committee, dismissed the notion that Netanyahu had simply been mistranslated. "He knew what he meant," King said on MSNBC. Netanyahu, who has emphasized his toughness on national security as he seeks reelection, often uses harsh rhetoric to describe Iran and its intentions. Israel considers a nuclear-armed Iran to be an existential threat and has sounded the alarm about Iran's influence in other parts of the Middle East. But Netanyahu generally stops short of calling for war in his public comments.The Israeli leader, who said he'd just finished meeting with Oman's foreign minister, has sought to highlight how communal concerns about Iran have enabled nascent ties between Israel and Sunni Arab states that had been unimaginable for generations.Countries such as Saudi Arabia, the United Arab Emirates and Bahrain that do not recognize Israel or maintain any formal diplomatic relations have started acknowledging more and more openly their behind-the-scenes ties to Israel and their quiet cooperation on security issues, most notably Iran.President Donald Trump has shared Netanyahu's views about the dangers of Iran and delighted the Israeli government with his decision last year to withdraw the U.S. from the 2015 Iran nuclear deal.But while the Trump administration had hoped to make this week's summit in Warsaw a rallying cry for tougher action on Iran, the focus had to be expanded and the emphasis on Iran softened after numerous countries balked, three foreign diplomats told NBC News. The U.S. ultimately dropped direct references to "Iran" from its official descriptions of what would be on the agenda in Warsaw.